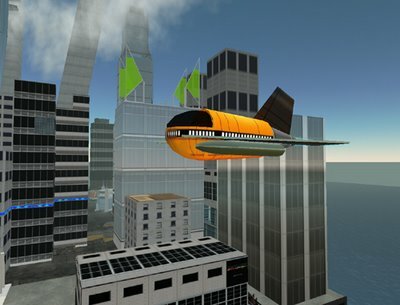 Earlier today a new page emerged at the Second Life wiki. 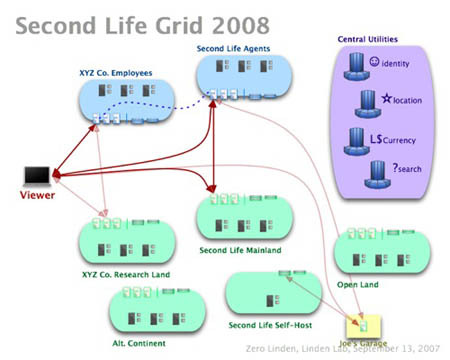 It's a page many of us have been waiting for: Zero Linden publishes the first draft outline for opening up the Second Life grid in Second Life Grid Open Grid Protocol, SLGOGP for short. "This protocol is about a three way interaction between viewer, agent and region in order to facilitate a shared experience between people. The viewer is the element that senses and acts on the state of the virtual world. The viewer does so from the vantage point of an agent. An agent is persistent identity and persona that interacts in a virtual world. The agent persists and can be interacted with even when the user controlling it (though a viewer) is off-line. Regions are persistent locations in the virtual world. Multiple agents may be present in a region at the same time, and when they are they have a shared experience. 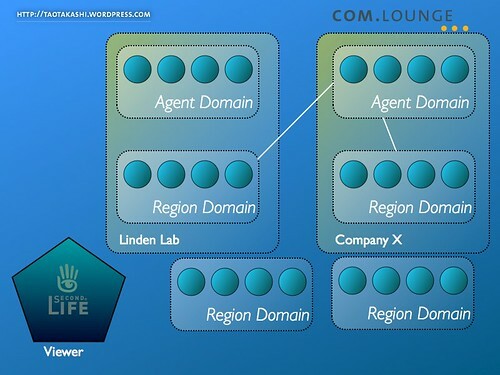 Groups of regions and agents are managed by domains. 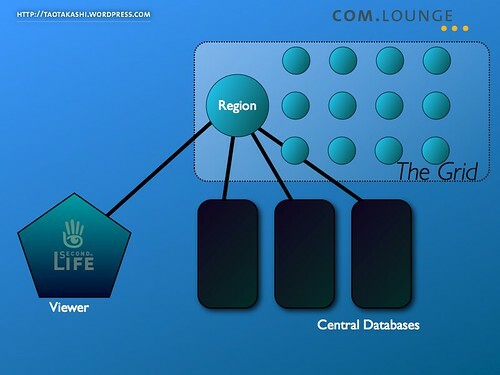 A region domain is responsible for a collection of regions. An agent domain manages agent accounts. a single process. It is useful to think of the “stance” that each element takes in the three-way protocol: The viewer is the direct proxy for a human that wants to control an agent. This control can be direct as in the case of an interactive 3D viewer, or indirect as in the case of a web site that the user directs to display their agent’s status. domain, and requests to interact with the agent, even by the viewer, are mediated by the agent domain. The region domain runs the live simulations of regions in the virtual world. The region domain manages the persistent state of these regions." I can't wait for the grid to open up and I'll be able to hook up my own sim. ... but Intel was celebrating a nice new deal as Linden Lab purchased a nice load of new Xeon 5148 servers. Starting February 1 you can upgrade your sim from class 4 to class 5. Upside is you get better performance, downside is rentals go up from $ 195 to $ 295 monthly (US Dollars). Residents didn't take that rise very well and reacted heavily on the Linden Blog, and dearly want Linden Lab to open the source of the servercode shortly. This will make islands a lot cheaper and will give users and companies alike better opportunities to experiment with Virtual Worlds. However, I've already seen infrastructure designs that would make this possible. The plan is on the table, so please don't hesitate to make it happen. ... we'll have to be patient though. I remember Linden Lab's Joe Miller stating that Second Life has no future as long as there's only one company controlling the grid. Outsourcing or Opensourcing seems to be question for Linden Lab as it is said that Linden Lab does want to open up its sourcecode --but only to a select group of companies (often mentioned names include Google and IBM). Infocalypse at the economic heart of Second Life? It's a warzone! The Linden Index has crashed, it's economy is imploding and one after the other financial scandal is hitting the blogoshpere. Someone just shouted "The end is near!" over at twitter. Well, there is some truth in this part of the blog. Due to Linden Labs taking actions against gambling in SL - incorporating RL law there has been a drop in money exchange. This will be a temporary setback as it will make way for new and healthy business. What is serious is that there has been theft at the WSE, the World Stock Exchange, an inside-job so it seems. Extensive coverage can be found at the Virtually Blind blog. Infocalypse at the social heart of Second Life? 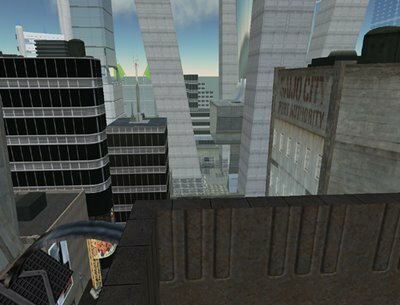 "The article cites well-known reports of "griefing" in Second Life -- malicious practical joking -- and employs a lot of breathless prose and distortion to make it seem like the global terror network is on the brink of using Second Life to launch a real-world terror campaign against all decent people everywhere." What will be the fall-out of these stories? In my personal opinion it is way overdone. These blogposts over at Second Thoughts and Metaversed are providing the Griefers a sublime stage. They're feeding it! It seems Prokofy's fabled paranoia and FICification have entered the next stage of the conspiracy-theory-virus. In my humble opinion, this is all strongly overhyped. This is confirmed by reliable sources who say that Linden "can shoot themselves in the foot just fine." Infocalypse at the creative heart of Second Life! 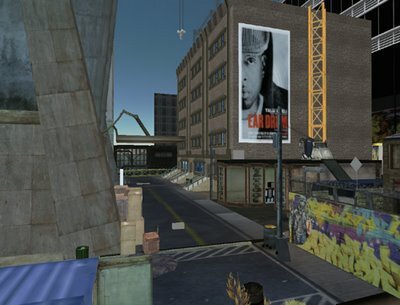 Before we all go dramatic on Second Life, here's the twist: The only place where real infocalypse is going down is on the islands of Infocalypse, Saijo City and Nexus Prime, home to the cyberpunk community and spindoctor Eric Rice. There's the Infocalypse project which is offering a podium and decorum for writing vivid new cyberpunk stories. Second Life proofs to be an excellent stage once more for collaboration and making stories come to life! Say you wanted to create derivative work, say, a novel or video game or drawing, and place it in those locations, technically you can’t. You *can* if you consider fan fiction (’fanfic’ for short), but don’t ever expect to do anything with it beyond your own personal amusement. Build as little as a fan site, one that celebrates a franchise, and you could be beamed up to the USS Litigation. This has a long history and is certainly not new (flashback: Wired, Dec. 1996). Enter Saijo City. Saijo exists as a newborn franchise that could be any one of those works of fiction. There are characters and there is the place of the city itself. Saijo’s genre is cyberpunk, set in a near future of maybe 60-100 years out. What makes Saijo City different and not spectacularly ‘new’, is that it exists as many pieces, both traditional and contemporary, that are simply rearranged. It would be easy to say, “Yes, I’m writing a science fiction book, due out this summer,” and the conversation would be over. But that’s not how life in my city goes. The grid is borked, Technorati down. What is going on? A major glitch for websites and web companies based in the SOMA district of San Francisco: a massive power outage cut the supply to datacenters including those of AdBrite, Craigslist, Netflix, Technorati and SixApart. Around 20,000 people are said to have been plunged into darkness, but the number of web users affected must be in the millions. Those affected are customers of Pacific Gas and Electric. After today's official Geek Meet was over several interesting discussions came by on other Metaverses and SLCC convention 'standards'- or rules of engagement whatever you wanna call it. Especially noteworthy was Moo Money's emphatic speech on Teen Grid. "It's a sad state of affairs over there, they're the forgotten grid with a terrible economy. The Lindens rarely visit and there is barely any teen owned islands. I had to get an educational sponsor, Global Kids, to say it was okay to be on their island and then I had to submit to a FULLLLL background check, including 10 year address history. They can buy 3x the amount of items for what we pay for one here. This leads to teens stocking up on items before they transfer over and selling them for profit which makes me so sad, it breaks my heart. I don't know about the rumors of TG joining MG, BUT once age verification is in place, LL basically opened the back door for them to come in. I spoke with a few that have said that if their friends all migrate over, they'll have no choice but to do it as well. They don't want to be alone. They keep their inventory, but their friends list is wiped, as well as calling cards, groups, and landmarks. Some of the teens are just as good or BETTER at building and yet they can't even make a decent profit on their furniture." Everytime the grid is down for maintenance it's a nuisance for the virtual junks. Another hour wasted! Okay, usually Linden schedules maintenance and takes its time to do a few fixes. Probably a good thing. I work as a project manager for a large IT company. I haven't tried selling the Linden message to them when we are to do some maintenance. I doubt they'll appreciate it, but in the virtual world it's common practise it seems. Let's face it, this is no Old School IT Governance, this is the flow of the new digerati generation. Yesterday I received a group notice from one of the groups I'm in. It warned me of a possible attack on the grid. Precautions had been taken, building had been turned off for the groups sims, only special measures would make it possible for members to do some scripting and building on their own parcels. GRIDWIDE - Griefer group Patriotic Nigras (PN), also known as /b/, have had their most damaging weapon disabled, but residents are urged to take precautions with their land to avoid smaller-scale attacks in the coming hours. PN have recently developed a very powerful griefing weapon known as the "Grid Destroyer," which is a very powerful and fast self-replicating object that could take down the entire Second Life grid in a short period of time, according to an anonymous source. Recently, we have received a number of requests from the Second Life community to seize land from long-term inactive Residents on the Main Grid. While we are unprepared to reclaim land from Residents who haven’t logged recently, we’ve decided to embark on a different approach, one we feel will produce more palatable results for both active and inactive Residents. Keeping your concerns in mind, we have reached out though e-mail to Lifetime Residents who own land and yet haven’t logged during the past 12 months. It goes without saying that we would all prefer to see those Residents return and participate again in the Second Life community. In this vein, we invited them to rejoin. In the event that those Residents are unable to return and in keeping with our commitments to active Residents who would prefer to see unused land folded back into the larger SL community, we have offered to auction inactive Resident land and deposit all L$ proceeds into the corresponding Second Life L$ accounts. We hope this approach satisfies all parties involved, and we will keep the community apprised of further developments.